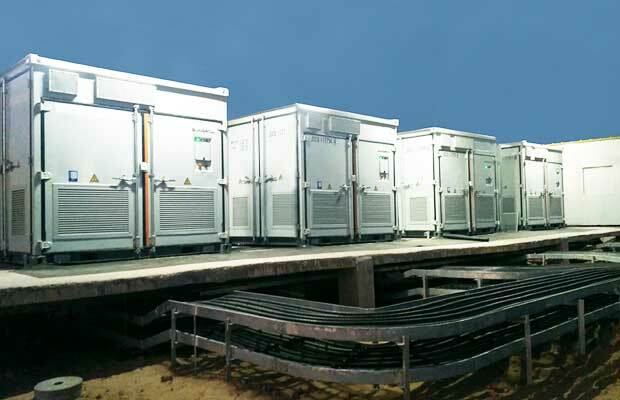 This containerised solution integrates energy storage inverters, lithium-ion batteries and medium-voltage transformers, which significantly saves on initial investment and upcoming O&M costs. As a global leading inverter solution supplier for renewables, Sungrow is showcasing multiple solutions at the ongoing Energy Storage Europe exhibition. These solutions help plant owners utilise solar energy efficiently before and even after sunset. Systems on display include the Company’s latest 1500V Energy Storage Systems (ESS) as well as residential hybrid inverters and lithium battery systems. For utility-scale applications, Sungrow is displaying its latest all-in-one 1500V energy storage system ST2740KWH-2500HV-MV. This containerised solution integrates energy storage inverters, lithium-ion batteries and medium-voltage transformers, which significantly saves on initial investment and upcoming O&M costs. Featuring high efficiency and allowing for system expansion, the solution is applied to frequency regulation, demand response, peak-shaving, energy arbitrage as well as renewable energy ancillary services. Focusing on fast-growing residential and Commercial & Industrial energy systems, Sungrow presents its new residential hybrid inverter SH3k6/4k6 and power conversion system SC50HV for 1500 Vdc System, which is characterised by its compact design, 22kg weight and ability to be easily installed by just one person. Meanwhile, Sungrow’s battery modules E2 and M2F have proven to be another state-of-the-art solution required from the industry. As the Company continuously pushes for innovation, these solutions not only create a higher investment payback but also have an industry leading life-cycle performance. The global energy storage industry is poised for takeoff. Storage applications in the field are set to proliferate as costs continue to decline. Currently, the market is highly concentrated on countries like the United States, Germany, England, Japan, Korea, and Australia. In Germany in 2018, 90,000 commercial and household operations invested in PV battery systems. Furthermore, only 8 percent of rooftop PV systems in Germany are equipped with an ESS today – by 2030 it could be well over 80 percent.